American duo George Merrill and Shannon Rubicam achieved their biggest success with this single, which reached #5 in the U.S. and #9 in the UK. Lifted from their second studio album Reel Life (the first was self-titled) the song was a one hit wonder in the UK, but one of two Top 40 hits in America, the other being Oh Girl which reached #49 in 1985. 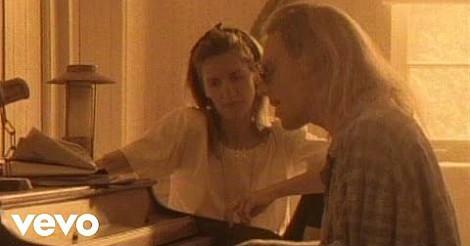 The follow-up single to Waiting For A Star To Fall was Bring Down The Moon, which peaked at #49 during 1989. A reissue of Waiting For A Star To Fall reached #76 in the UK in 1991, and this featured as the closing track to the movie Three Men and a Little Lady. Merril and Rubicam also penned hit singles for Whitney Houston, Deniece Williams and Bette Midler during the 80s. Apparently, the song's inspiration comes from an actual falling star that Shannon Rubicam had viewed at a Whitney Houston concert. The duo sent the song to Clive Davis in the hope that he would consider using it on Whitney Houston's next album. However, he rejected the song. It was then offered to Belinda Carlisle who did indeed record the song, but Carlisle rejected it for inclusion on her Heaven On Earth album. 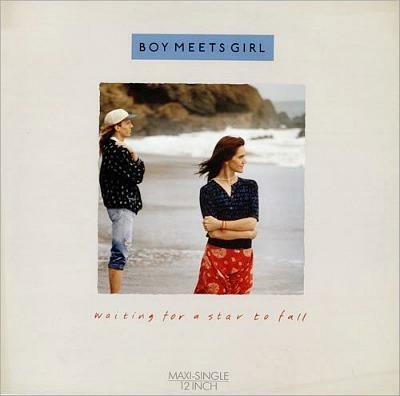 So Boy Meets Girl decided to record the song themselves for their Reel Life album and was released as a single on June 10th 1988 in the U.S., and Nov 30th 1988 in the UK. The single climbed to it's peak position of #9 in the UK for one week on 15th Jan 1989. The single was re-released with a new sleeve in 1990 after it was used as the closing track in the film Three Men and a Little Lady. However, it only reached #76 in the UK.